Are you frustrated with the constant referral of simple hard and soft tissue development cases? Our two day Hard and Soft Tissue Development Course is designed for the dentist who has placed minimal dental implants and is ready to handle minor implant failures as well as acquire additional hard and soft tissue development skills. This course is an intense experience providing live inter-active surgery, hands-on experience with site development and surgical systems, and innovative surgical techniques and case discussion. 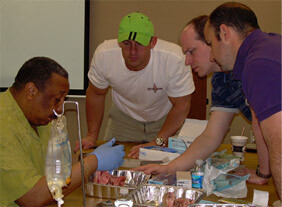 Regenerative procedures, the application of grafting materials, preservation techniques, reduction of complications, and post-operative protocols are just a few of the subjects addressed in our comprehensive course. Seize the opportunity to expand your knowledge and develop new skills. This course will enable you to increase your patient services, case acceptance, and your profitability. Our mission is to provide you with a unique continuing educational experience and support you after the completion of the course to ensure your continual growth as a dentist.